The year 2016 is when the foundations for many of us were shaken to such an extent that the future turned from being bright and hopeful to being uncertain and frightening. The Polish State Studs are the national treasures of Poland and they are invaluable for that reason alone. 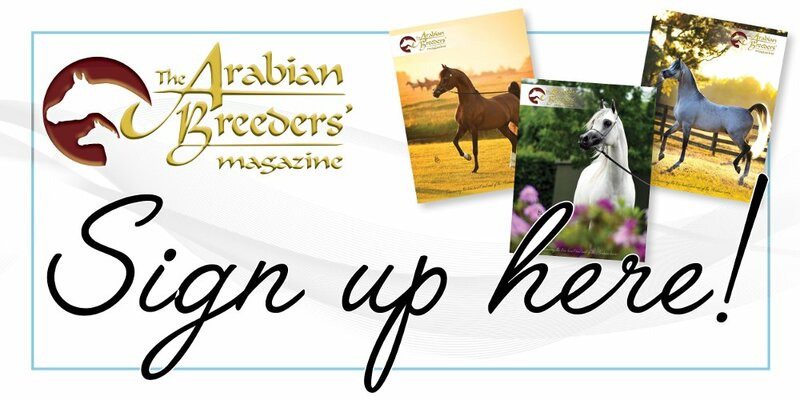 But for Arabian horse breeding worldwide, Poland’s State Studs have a vital role as the place where you will find consistency, preservation of sire and damlines, and well-bred horses through generations of knowledge shared from master breeders and horsemen to the next generations of master breeders. On 19 February, all of this was threatened, and not by an outside force like so many previous times through Polish history such as when war struck and the Arabian horse breeding was severely hurt. This time, the damage would come in a time of peace and by Polish people themselves. A lot of people did not want to come to the annual auction and the Polish National Show this year. I totally understand that, and I feel that everyone should do what they, deep inside, believe is the right thing for them to do. For me, Poland is home and I have lived with the love for Poland and Polish Arabian horses for the past 34 years. After my first trip to Poland in 1989, there was no turning back for me; I am totally devoted to these horses with all their history and great heritage. I have a deep love and respect of the horses as well as the people working with them, and I think that we should all respect and admire these horses that are so much more than a horse. These wonderful creatures truly represent Poland. I felt that I only had one choice when it came to August. I needed to go to Poland and be there for the sake of the horses and for all my dear friends that are working at the State Studs. I have been there through good times and through bad, and I felt that no way I can abandon them now. A total of 140 horses were entered in the catalogue and 125 of those were shown during the weekend. The judges of the show were Scott Brumfield, USA; Marc Veray, France; Irina Stigler, Russia; Michaela Weidner, Germany; and Koenraad Detailleur, Belgium. First out were two classes with yearling colts and six colts were shown in each section. The first class was won by Janów Podlaski´s grey Abdank who scored 90.88 points. He is a son by Empire (Enzo x Emira) and out of Altamira (Ekstern x Altona) who was sold at the 2015 Pride of Poland auction to Halsdon Arabians, UK. Altamira has herself been a successful show horse and a great producer. 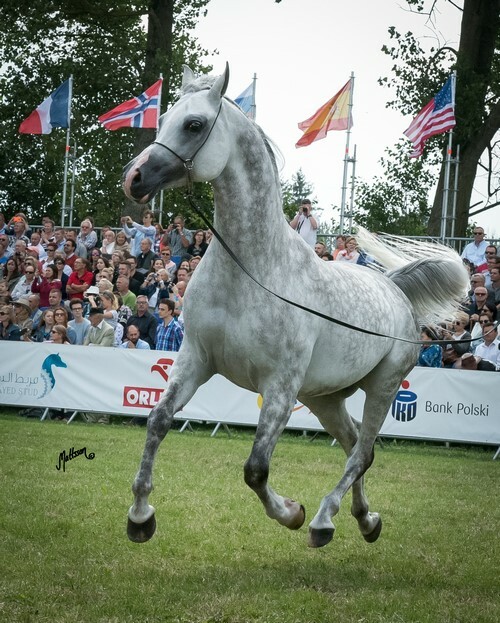 She left five offspring in Poland and four of those have been shown – the Chief Sire Amanito (by Eden C) was Autumn Show Junior Champion Stallion; Anawera (by Piaff) was Białka Spring Show Gold Junior Champion Mare; Adelita (by Kahil Al Shaqab), European Gold Junior Champion Mare; and now Abdank started out his career this season. Second placed was the great moving Elidus (HK Krystall x Elidia) from Białka Stud who got 90.13 points. He is from the first foal crop of HK Krystall (LD Pistal x Lisa Mine), bred and owned by Joanna Kale, USA and leased to Białka Stud. 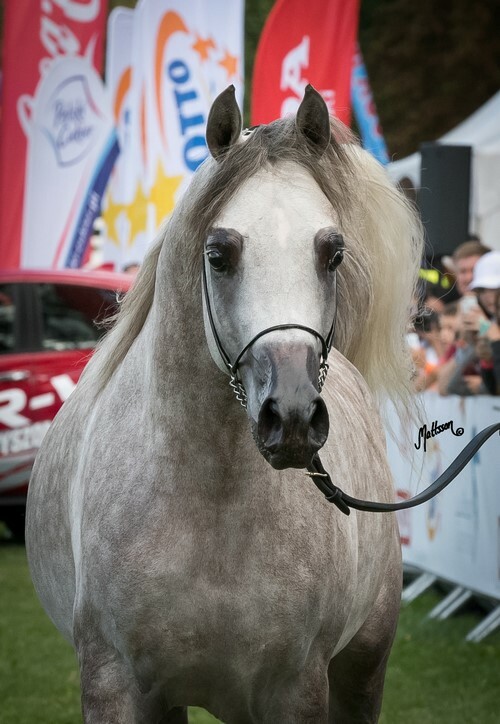 Elidus has started out his career winning a Silver Championship at the Buksza Show and the weekend after Polish Nationals he was Al Khalediah European Horse Festival Junior Bronze Champion Stallion. Section B was won by the bay Dastan from Michalów Stud. He is by Equator (QR Marc x Ekliptyka), currently standing in USA on lease to Aljassimya Farm. Dastan is out of Dama Pik, a daugther of Enzo and out of the great-moving Dama Kier (Gazal Al Shaqab x Demona), the full-sister to Drabant. Dastan was awarded with 91 points. Second placed with 90.13 was another Michalów-colt, the grey Esido (Empire x Esidona). Nine colts were shown in the class for two-year old colts and the winner was Fuerte (Shanghai EA x Frymuszka) with impressive 92.63 points. Bred by Jan Dobrzynski and owned by Sami Ben Saad, Fuerte was the Gold Junior Champion in Radom in July and one week after the Polish National Show, he was Al Khalediah European Horse Festival Junior Gold Champion Stallion, so it was no surprise when this promising young colt was named unanimous Polish National Gold Junior Male Champion, the only unanimous champion at the show, on the Sunday morning. 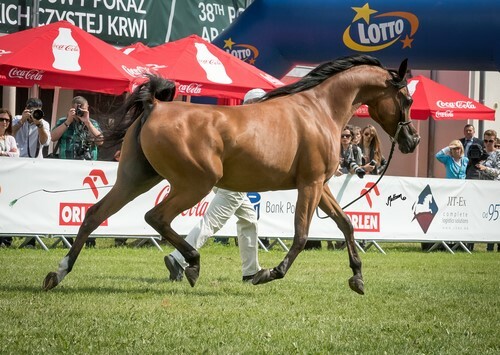 Fuerte is the first private bred and owned horse awarded with the Gold Champion title at the Polish National Show. Girlan-Bey (Pesal x Gracja-Bis) was named 2003 Polish National Junior Champion Stallion, but at that time the Championship was held at the Junior Spring Show in Białka. The Polish National Silver Junior Male Champion was Białka´s Elidus and the Bronze winner was Sokrates (EKS Alihandro x Sotika), who placed second in the class after Fuerte with 91.13 points. 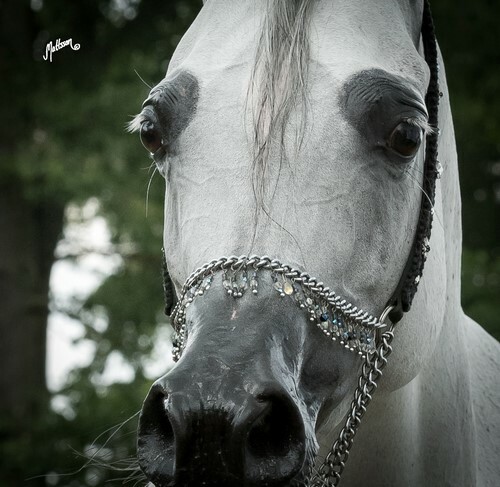 Sokrates is bred and owned by Falborek Arabians. The three-year-old colt class had five entries, all from private breeders, and the winner was Calateon (Vitorio TO x Calatea) with 91 points, bred and owned by Marek Kondrasiuk. The evening continued with the stallions, divided into three classes. 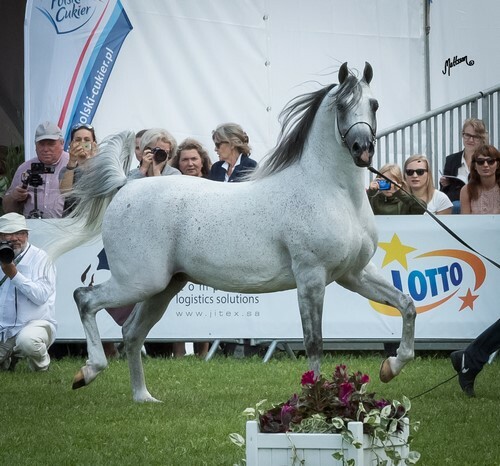 Stallions aged four-to-six-years old had 10 entries and the private breeders continued to have success when the charismatic Espimar (Marajj x Espinezja) won the class with 91.38 points. This six-year-old dark bay stallion was bred by Falborek Arabians and is owned by Idris Hassan. Second place went to Janów Podlaski´s Barok (Om El Bellissimo x Baida) who earned 91.13 points, the same as the third placed Psyche Ull (Forteynas Magic x Psyche Victoria), but Barok won by type. Psyche Ull is bred and owned by Chrcynno-Palace Stud. 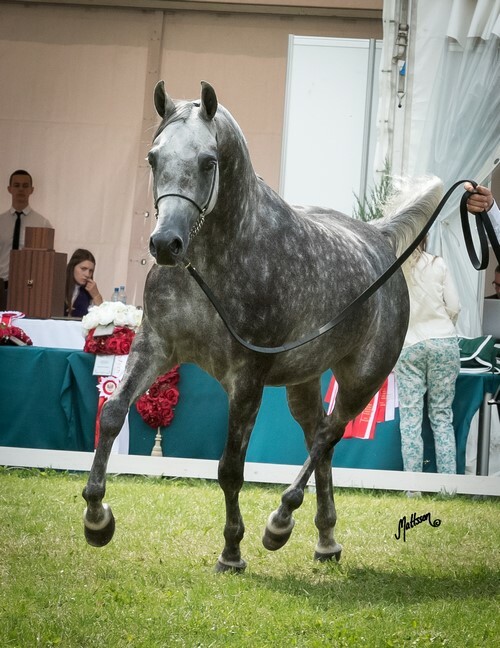 Section A of stallions aged seven years and older was won by the Polish National Junior Gold Champion Stallion Empire, a son of Enzo and out of Lot 0 at the auction – Emira (Laheeb x Embra). Empire got 91.38. Second place with 91 points went to Amanito (Eden C x Altamira), bred and owned by Janów Podlaski. 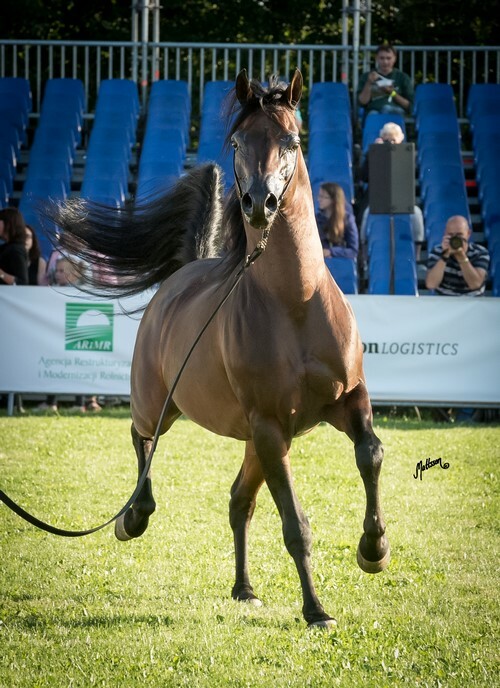 Section B of stallions aged seven years and older had five entries and the winner with almost perfect score on movements (19.5-20-20-20) and a total score of 91.88 points was Janów Podlaski´s great dressage stallion Almanzor (El Nabila B x Alantina). Second place was another of Janów Podlaski´s stallions, Albano (Enzo x Alena) with 91.75 points. Like Almanzor, Albano has not yet been used in breeding at Janów Podlaski, but he has successful offspring in Scandinavia from the time when he was leased out to Turban Stud in Denmark. During this time, he was shown and was DK Open Gold Champion Stallion and Danish National Gold Champion Stallion. 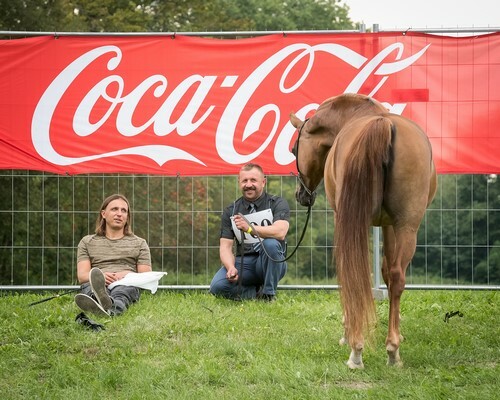 This class in Janów was tough class and close behind Albano with 91.63 was the well-known successful Girlan-Bey (Pesal x Gracja-Bis), bred by Michal Bogajewicz and he is owned by the Kristoffersen family. The Championships were going to be very interesting and the judges did not fully agree on the placing among the stallions so it was a close call when Albano was named Gold Champion with a score of 86 points before Espimar who scored 84 points and was named Silver Champion Stallion. The Bronze Championship went to Empire with 74 points. Saturday morning started out with three yearling filly classes and the quality was great. The first section was won by the chestnut, great moving Emanolla (Vitorio TO x Emandoria) with 91.38, bred and owned by Michalów Stud. Second place went to another daughter of Vitorio TO (DA Valentino x Sol Natique). Vitorio TO was leased to Michalów stud 2014-2015, bred by Thirteen Oaks Arabians and owned by Janey Morse, Oak Ridge Arabians, USA. Praga received 90.88 points and she is bred and owned by Janów Podlaski. She is out of the maternal sister to Pogrom, Perla, another great-producing daughter of Ganges. Section B was also won by Michalów Stud with another chestnut filly, Poganinka, who scored 91.63 points. She is by Polish National Gold Champion Stallion El Omari (Enzo x Embra) out of Pentra (Poganin x Peczora). Second placed was one of Janów Podlaski´s yearlings by Pogrom, Beira with 91 points. Beira is out of Berenika (Eden C x Belgica) who sold at the Pride of Poland auction last year to Nina Suskevicova, Suweco Stud in the Chech Republic. The winner in section C had many eyes on her, the bay Pamina (Pogrom x Pianissima) was the Białka Spring Show Gold Junior Champion Mare and she is the last offspring of the legendary Pianissima. She scored 91.5 points. Second place with 91.13 points went to Elawira (Kahil Al Shaqab x Ekliptyka), bred and owned by Michalów Stud. This bay filly is a maternal sister to Equator. Janów also captured the win among the first two-year-old filly class when the 2015 European Gold Junior Champion Mare Adelita (Kahil Al Shaqab x Altamira) won the class with impressive 92.5 points. With equally impressive score, Michalów´s Pontia (Equator x Polonica) placed second with 92.38 points. Section B had eight entries and the winner was Michalów Stud´s Foggita (Vitorio TO x Foggia) with 91.63 points. 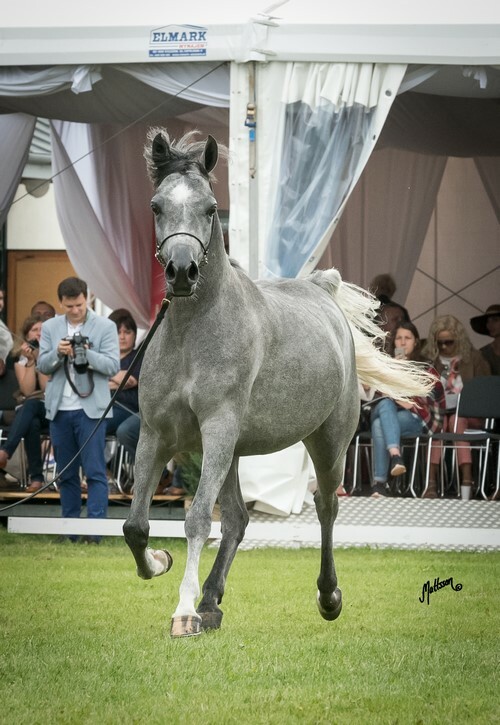 Second place went to Prunella (Abyad AA x Pradera), a filly with a very international pedigree as her sire is the Straight Egyptian Abyad AA (Nader El Jamaal x Al Amaal AA) from Ariela Stud in Israel and out of Pradera, who is a daughter of the Jordan stallion Hlayyil Ramadan (Kamar El Zaman x Haboub), a stallion that Marek Trela first saw in Jordan and wanted to breed to. Janów bred two mares to him and Pohulanka (Pepton x Pestka) got a filly, Pradera. Seven fillies were shown in the three-year old class, all privately bred except for Galerida (Shanghai EA x Galilea), bred and owned by Michalów Stud. 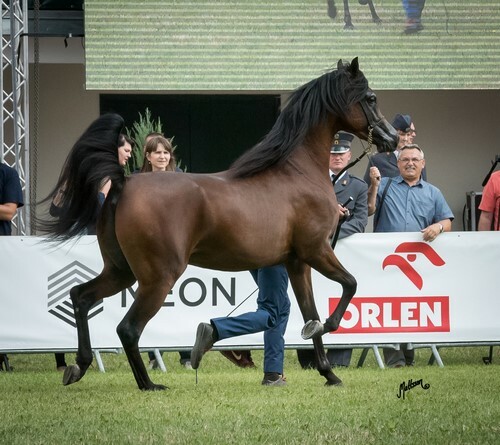 She was awarded with high scores for type and with 92.5 she won the class before Echo Ariadna (Kahil Al Shaqab x Echo Kallisto) from Chrcynno-Palace who scored 91.13 points. The quality in the class was very high and with a score of 91 points Falborek Arabians Washa (Kahil Al Shaqab x Wasa) placed 3rd. The highlight of the Polish National Show is always the mare classes and this year was no exception. In the first section of mares aged four-to-six-years-old, all eight mares shown scored over 90 points and the first two scored over 92 points. The winner was another Altamira offspring, making her the best producing mare at the show. Anawera (Piaff x Altamira) scored 92.38 points and Emandorissa (Abha Qatar x Emanda) received 92.25 points which placed her second in the class. Third and fourth place went to Janów Podlaski´s two look-alike chestnuts by Eden C – Paterna (ex Pinga) with 91.75 points and Patria (ex Palmeta) with 91.25 points. The second section of mares aged four-to-six had nine entries, with the first five scoring 92 points and over. The winner was surprisingly the bay Diara (Eryks x Diaspora) with 92.63 points. She is a beautiful mare and a great mover but maybe not the horse that we would have guessed as the winner looking at her competitors. 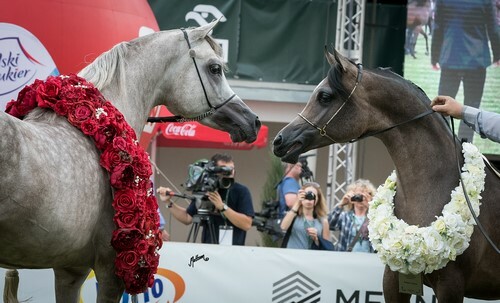 Second and third place went to two great-moving bay beauties from Michalów – Cheronea (QR Marc x Chimera) with 92.5 points and Emandilla (Om El Shahmaan x Espadrilla) with 92.13 points. 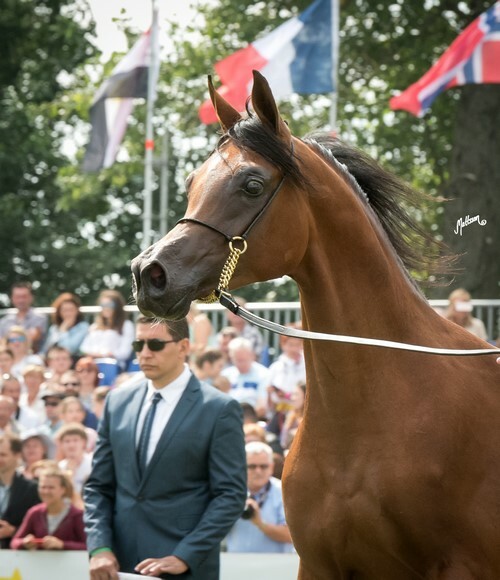 With the same points but beaten by type, Janów Podlaski´s Bernadetta (Ganges x Belgica) was placed fourth and the horse that many predicted as the winner was placed fifth this time, the great Wieza Mocy (QR Marc x Wieza Marzen) with 92 points. 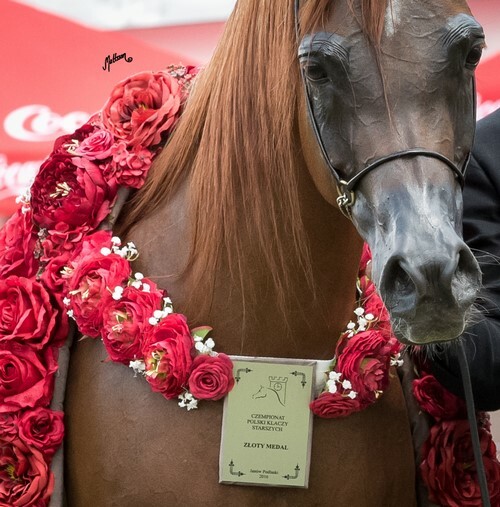 The mares aged seven-to-ten years were also divided into two sections and the first one was won by the stunning chestnut Palatina (QR Marc x Palmeta) with 93.5 points, one of the highest scores of the show. 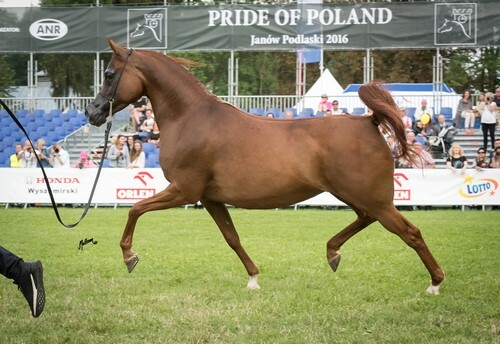 She was bred by Janów Podlaski and sold at the Pride of Poland auction to PPH Parys Ltd. Palatina is a great-moving mare and she is getting more and more beautiful with age, looking like a chestnut copy of her amazing mother. 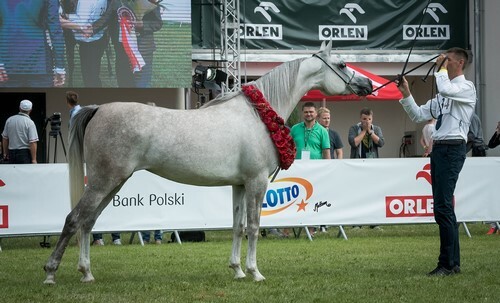 Primera (Eden C x Preria), bred and owned by Janów Podlaski, received 93 points which placed her second and in third place we found another mare from Janów, the grey Pilarosa (Al Adeed Al Shaqab x Pilar). All three first placed mares have the legendary Pilarka (Palas x Pierzga) as a great-granddam, which shows the huge importance Pilarka has on the breeding programme at Janów Podlaski. Section B was won by Psyche Victoria (Ekstern x Pallas-Athena) with 92.75 points, bred and owned by Chrcynno-Palace Stud. She is also a member of the valued Szamrajówka family but she traces down to Pentoda (Bandos x Piewica) when the others belong to the family of Pierzga (Negatiw x Piewica). Second place in this class went to Lawinia (Ekstern x Luanda) with 92.50 points and third place to Elliseina (Galba x Ellissara) with 92.13 points, both mares bred and owned by Michalów Stud. 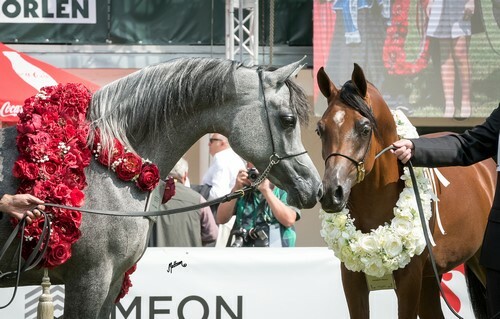 The last mare class was a joy to watch with mares aged 11 years and older, and the winner here was the lovely fleabitten Euspira (Gazal Al Shaqab x Euskara), who got the highest score of the show, together with Palatina, of 93.50 points. 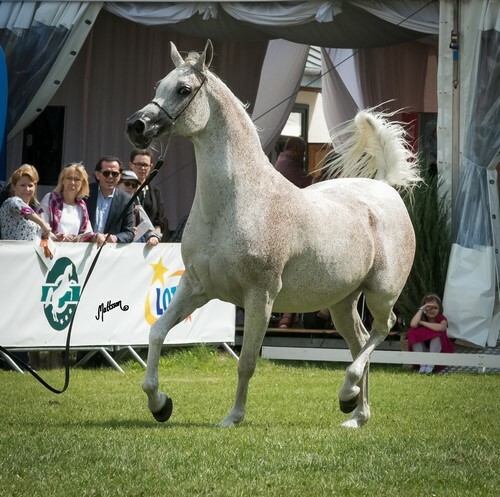 She is bred and owned by Białka Stud and very precious to them as the last daughter they have by Gazal Al Shaqab. The Junior Female Championship was interesting as the judges did not fully agree in their pick of champion, but with 64 points Prunella was awarded with the Gold Championship and Pamina with her 56 points was awarded Silver Champion. Bronze Champion with 50 points was Galerida. This National Show would not only bring one historical championship but two Gold Championships to private owners. 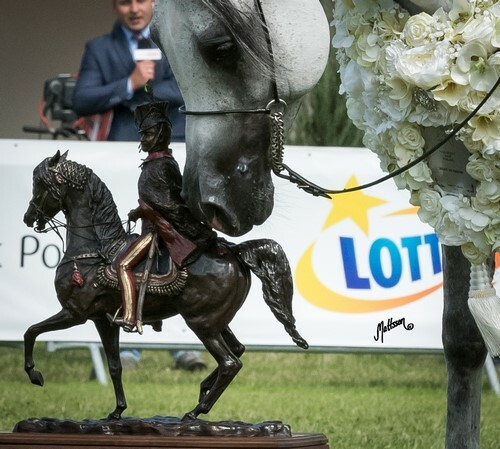 The Polish National Gold Champion Mare Palatina was bred by Janów Podlaski, but she is now owned by PPH Parys, so for the first time ever a private owner was the winner of the Gold Mare Championship. Palatina´s dam, Palmeta, was herself the 2002 Polish National Junior Champion Mare and Best in Show and 2012 Polish National Champion Mare and Best in Show, making her one of three horses that claimed the National Champion title with the Best in Show as both a Junior and a Senior, the other two being Pianissima (Gazal Al Shaqab x Pianosa) and Pinga (Gazal Al Shaqab x Pilar), all three of them with Pilarka as their great granddam. Palmeta is one of the best producing mares at Janów and Palatina is her third Polish National Champion, the other being Palabra (by Enzo), Polish National Gold Junior Champion Mare and Best in Show and Palatino (by Pesal) Polish National Gold Champion Stallion. 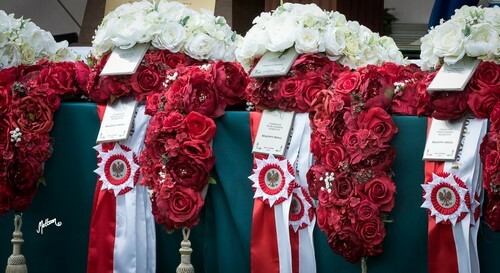 The Silver Champion title went to Białka Stud and the regal Euspira, while Bronze was Cheronea from Michalów. The Best in Show Trophy stayed at Janów Podlaski when Albano was named Best in Show. The judges were not in agreement over this either and all four horses – Albano, Prunella, Fuerte and Palatina – got votes but Albano was the lucky one, being picked by two of the five judges. You can read the full report from Anette’s visit to Poland in the September edition of The Arabian Breeders’ Magazine, out in print at the end of September.